Bad guy plastered on a brick wall. you’ll taste mint and smell fire. My hair is made of nebula. have clothes, just a ruby glaze. the squeeze on Mr. Starbucks. special sauce in town. I save the day. the void waits with a crooked grin. the burning phobia. I still need sleep. eyes. There is a knock. I go to the door. with the story of a gun. Screams. I make all the wrong decisions. In 1985, David Arroyo was struck by a meteor. He was minding his own business, watching Aliens for the twenty-seventh time on HBO. Since then he’s been writing verse shimmering with the power cosmic. He’s been published by Burning Word and Stirring and is earning an MFA in Creative Writing through Stonecoast. Editor’s Notes on “Captain Volta”: This poem transcends humor. It’s a successful experiment in sound, edging into performance poetry territory, but much more masterfully done. Humor, like horror, is a powerful stylistic tonal tool (as opposed to being considered genres as some do). Sometimes, as this poem accomplishes, profound things can be said through a humorous delivery. 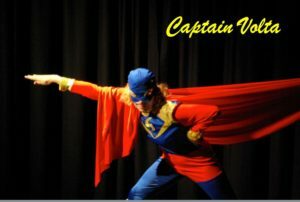 The image is a generic superhero (artist unknown), which is actually a synthesis if many known superheroes; it is dubbed Captain Volta after the poem.